Reviving long-forgotten traditions, Alfonso Mendoça’s Paraiso del Sinú collection perfectly recaptures the ethnic imagination of the ancient indigenous tribe Sinú from Córdoba, Colombia. With prints and colors inspired by the magnificent beauty and magic of the Colombian fauna, such as the omnipresent jungle-like landscapes and the majestic river Sinú: elements that form a much needed equalizer in a time in which cosmopolitan cities increasingly devour mother nature. As the ultimate antidote to these developments, each accessory in this collection is an exclusive piece of art exuding joy, peace and relaxation. Exploring his concept of ‘luxury ethnic fashion’, all pieces are handmade of organic materials, whilst synthesizing ancient old artisanal techniques with modern-day designs. Product code: AM301111 Categories: Under 200, Necklaces. Necklace: organic lightweight wood, synthetic eyelets and three layers of resin for ultimate durability. The accessories of Alfonso Mendoça can easily be cleaned with a clean and dry cloth. The ribbon can be washed with mild soap and cold water. Since all of these pieces are created by hand, resulting in unique pieces, minor differences can occur between the item as shown on the photo and the one that you will receive at home. 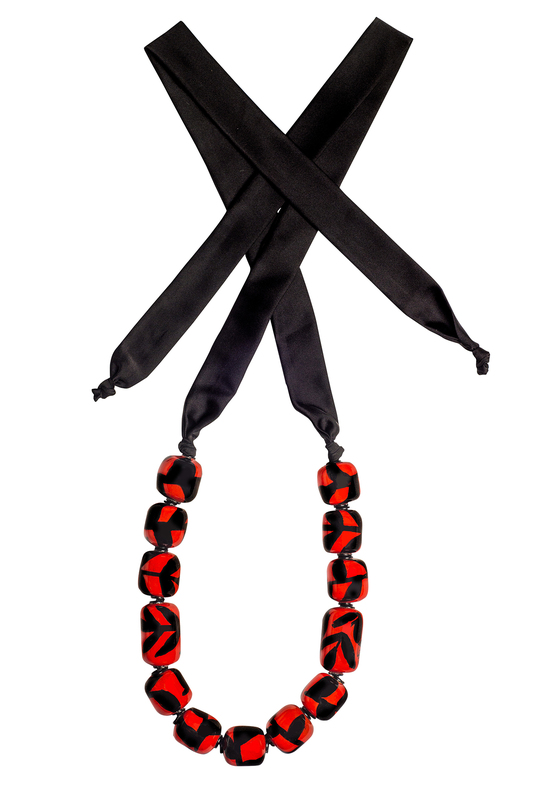 The total length of the necklace depends on where you tie the ribbon. Measurements are therefore estimated and of the wooden part only. Thickness: 5 cm / 2 in. Length: 30 cm / 11,8 in. Width: 29 cm / 11,4 in. 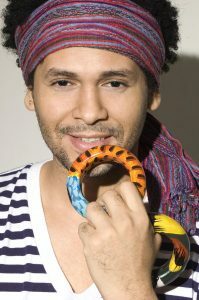 As from the moment Alfonso Mendoça launched his first collection in 2007, magazines such as Vogue, Harper’s Bazaar, Marie Claire, Elle, Ocean Drive, Caras, Cromos, Mujer and so on contributed to the success of this young creative South American by featuring his accessories. He is king in mixing global trends with the archetypal South-American color pallet of solid pigments interspersed with deep and explosive colors. Resultantly, these fashionable creations are beautifully made, one-of-a-kind statement pieces that simply refuse to go out of style. Manually made by local artisans, every colorful necklace and every maxi bangle also bears a unique story. All woven and beaded wristlets are entirely handcrafted by indigenous tribes living in Colombia’s tropical rainforests. Each piece represents over forty hours of handwork. As a celebration to this native artistry, the Taganga Purple is an armlet inspired by the purples of Taganga’s sunset. Tanganga is a beach town in Colombia. The 24K gold plated embellishment is a replica of a pre-Columbian Tairona nose ornament. The figure represents the indigenous symbol of status and power of the Shaman. By combining traditional bead weaving with 24K pre-Columbian gold plated ornaments, these Latin luxe bracelets are captivatingly festive and unique. Both exotic and chic, this beautiful enameled Rio Mornings bangle is a true statement piece. This 24K gold plated bracelet has been inspired by the mysterious and enchanting mornings of the Amazon with its beautiful sunrises, its golden anchors and the enlightenment of the sunrays falling down on its palm trees. This unique gem adds a jazzy flavor to any outfit- day or night. For a fiercely glamazon and cheery effect, you can mix and match multiple enamel bracelets. Enameling is a delicate process. As such, it can take up three to four days to produce one single enamel bangle. The design of this 24K Gold Plated ‘El Dorado Ring’ has been inspired by the pre-Columbian gold work attributed to the Zénu and Tairona tribes of the Neguanje who lived in the period of 300 to 800 CE. The frog symbolizes power, fertility and richness. A unique ring representing an ancient history with a contemporary edge. Extravaganza Deluxe! All woven and glass beaded wristlets are entirely handcrafted by indigenous tribes living in Colombia’s tropical rainforests. Each piece represents over forty hours of handwork. As a celebration to this native artistry, the Tayrona Stars is an armlet inspired by the stars of the night as seen by the indigenous in the Amazone. The 24K gold plated embellishment is a replica of a pre-Columbian Tairona nose ornament. The figure represents the indigenous symbol of status and power of the Shaman . By combining traditional bead weaving with 24K pre-Columbian gold plated ornaments, these Latin luxe bracelets are captivatingly festive and unique. All woven and glass beaded wristlets are entirely handcrafted by indigenous tribes living in Colombia’s tropical rainforests. Each piece represents over twenty hours of handwork. 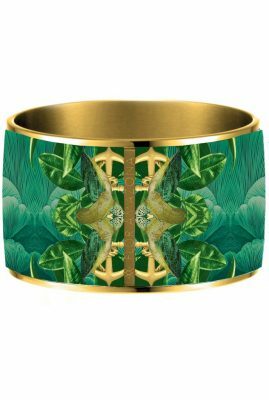 As a celebration to this native artistry, La Magica is an armlet inspired by the magic of the jungle and its striking blend of colors. By combining traditional bead weaving with 24K gold plated ornaments, these Latin luxe bracelets are captivatingly festive and unique. This beautiful enameled 24K Gold plated bangle is a true statement piece, the perfect blend of exotic, chic and the unexpected. 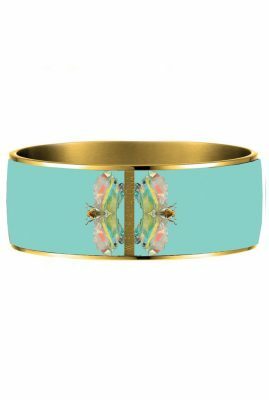 The underwater colors of the Pacific Ocean and the bugs, crystals and precious gems found in the nature served as inspiration for creating this bracelet. This unique gem adds a jazzy flavor to any outfit- day or night. For a fiercely glamazon and cheery effect, you can mix and match multiple enamel bracelets. The back exterior features a 24K gold plated Flor Amazona logo. Enameling is a delicate process. As such, it can take up three to four days to produce one single enamel bangle. Akin to the ancient-old Tayrona nose decorations, the Tairona ring has a palpable pre-Columbian touch. This 24K gold plated ornament is a pristine testimony to the status and power of the Shaman; the leader of the Tairona tribes. Extravaganza Deluxe! 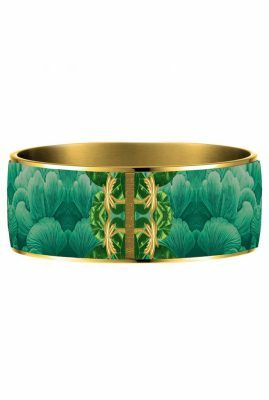 This beautiful enameled Gold plated bangle is a true statement piece, the perfect blend of exotic, chic and the unexpected. 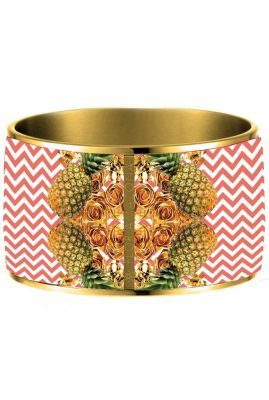 The sweetness of the pineapple and the floor prints of the Copacabana Boulevard served as inspirations for creating this bracelet. This unique gem adds a jazzy flavor to any outfit- day or night. For a fiercely glamazon and cheery effect, you can mix and match multiple enamel bracelets. The back exterior features a 24K gold plated Flor Amazona logo. Enameling is a delicate process. As such, it can take up three to four days to produce one single enamel bangle.